From Goodreads: Everyone thinks their parents are embarrassing, but Hannah knows she's got them all beat. Her dad made a fortune showing pretty girls--and his "party" lifestyle--all over the Internet, and her mom, who was once one of her dad's girlfriends, is now the star of her own website. After getting the wrong kind of attention for far too long, Hannah has learned how to stay out of sight...and that's how she likes it. Of course, being unknown isn't helping her get noticed by gorgeous, confident Josh, who Hannah knows is her soul mate. Between trying to figure out a way to get him to notice her, dealing with her parents, and wondering why she can't stop thinking about another guy, Finn, Hannah feels like she's going crazy. She's determined to make things work out the way she wants....only what she wants may not be what she needs. I haven't read an Elizabeth Scott novel I didn't enjoy and this is no exception. I really enjoyed it. It felt shorter than some of her other books and I certainly finished it quickly but I really liked the story. Hannah was a really sweet character and I loved how she was completely oblivious of her real feelings - for her father as well as for Josh and Finn. It was great watching her work them out. I liked her friend Teagan and Finn was just adorable! I really love the male characters Elizabeth Scott creates in her books. They are not always the most gorgeous or popular, but they always seem to fit perfectly with the main character and you can't help but root for them to get together. This outing was slightly more predictable than her others but I found it comforting rather than disappointing. I was able to enjoy the ride and looked forward to the ending. 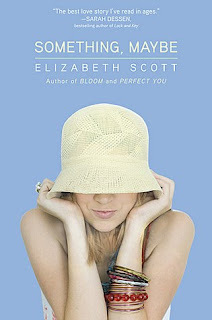 I really do love Elizabeth Scott's books and can't wait for her next novel. Glad you loved it! I've only read two of her books so I really need to catch up! I'm currently reading Olive Kitteridge and enjoying it so I'll have to add this one to the TBR list as well! I want to read that LOL - I have this one, I just recently picked it up, I have not read anything by Scott and this one sounds really good...I hope to get to it soon! Loved your review! I'm not interested in this one but I love the cover. So cute. I like the cover but I get the sense that the model was older than the book character. I'm interested to hear what you think on that. I think if I give this author a try I'll start with one of your other recommendations. Becky - The character is 17 years old - did she seem younger? Although I did enjoy this one I think if you try one you would be better starting with one of her others (Perfect You or Stealing Heaven). I liked this story a lot too. I loved Hannah and the whole premise with her mom and dad etc. It was super interesting and different.